In the opening pages of The Middle of the Air a truck carrying nuclear materials goes missing and the search for this truck and for the people responsible forms the central mystery of the plot. In spite of this ominous subject, the tone of the book is actually very light and fun. When I wrote the book this was purely a figment of my imagination, inspired partly by the fact that the Asheville/Hendersonville area in the mountains of Western North Carolina lies on the route that leads between the Savanna River Nuclear processing site in South Carolina and Oak Ridge, Tennessee. It was also inspired by our nation’s misadventures in the war with Iraq. In the war we had some leaders in the administration ignoring the cautions of military and State Department experts about how dangerous and difficult the war and occupation would be. In my book the same kind of leaders decide to cut corners with regard to the handing of dangerous materials. In the last few weeks several news stories have converged to draw attention to the issues of nuclear materials in Western North Carolina. One, of course, is the terrible damage and suffering in Japan and the danger posed by the damaged nuclear power plants there. This comes just at a time when the U.S. is revisiting the idea of opening more nuclear plants in the interest of reducing fossil fuels and dependence of foreign oil. Less known are plans to reprocess spent fuel at the Savanna River site, and even less known than that are studies to bury waste at a site called Sandy Mush near Asheville. The Middle of the Air was intended to be a purely fictional fun read but has taken on a level of political and social realism I did not foresee. If you want to learn more about the issues from people who actually know the facts and issues visit www.NoNuclearWasteInWNC.com. 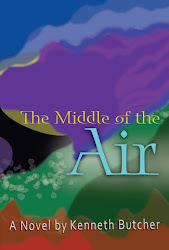 If you want a fun read pick up a copy of The Middle of the Air.